For many people, burpees are one hell of exercise. Sometimes called squat thrusts which they're not (squat thrusts are typically performed without the vertical jump), burpees are one of the best body-weight workout. The exercise was named in the 1930s for American physiologist Royal H. Burpee, who developed the burpee test to assess the fitness level of military recruits. King of bodyweight exercises according to Daily Burn trainer Anja Garcia, burpees target quadriceps, glutes, core but also chest, back and shoulders. Burpees are hard because they are basically 3 exercises, all of them quite challenging, wrapped in 1: a squat, a pushup and a plyometric jump. Burpees are the full-body exercise that everyone loves to hate but you can’t argue with results. 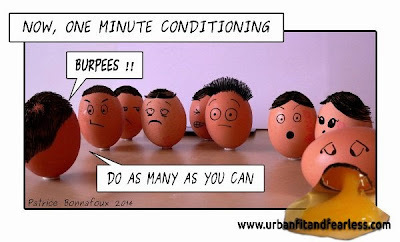 - Burpees provide an intense full-body workout that turns your body into a fat burning machine. When doing burpees, you use a large number of muscles but also big muscles groups. All that activity requires lots of calories. - The intensity of the exercise will also trigger the after-burn effect, well known from high intensity training protocols, that is your metabolism burn calories for several hours after your session is finished. High intensity exercises like burpees burn up to 50% more calories than more conventional exercises. - Burpees make you stronger because it is a full-body strength exercise that works many muscles groups such as pectoral, arms, shoulders, legs, abs and even the back. - More importantly, it is a body-weight workout that is done in an explosive/dynamic manner. - Burpees are great for developing conditioning and endurance (why do you think burpees are used in the roughest conditioning routines?). - Intensive full-body exercise such as burpees really develop cardiovascular capacity because all those muscles requires lots of oxygen to function properly. 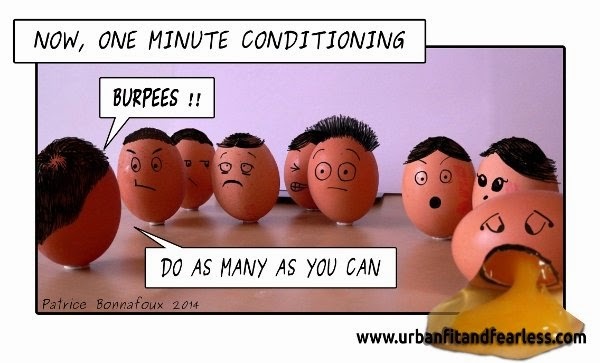 - Burpees require absolutely no equipment. No expensive gym membership, no fancy machine. They don't even require lots of space. Kick your feet back, while simultaneously lowering yourself into the bottom portion of a pushup: chest an inch from the floor and arms flexed. Immediately return your feet to the squat position, while simultaneously pushing "up" with your arms. You will perform a pushup as you return your feet to the squat position. Leap up as high as possible from the squat position. Repeat, moving as fast as possible.